Using HyPneu to simulate the combine is very quick and easy due to the Universal Valve Builder (UVB) within the Shape Designer. Modular valve construction allows for control of various work functions from a valve stack, eliminating the need for plumbing connections and space requirements. With UVB, HyPneu allows numerous spool and control options. As shown here, the reel, cutting bar, auger speed, and others are simulated. The main design goal of hydrostatic transmissions, HST, is to accept power from a source that will transmit energy to maintain and regulate functionalities. 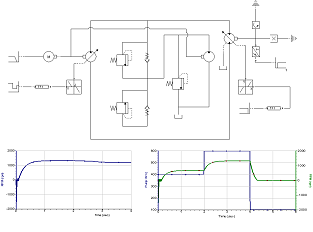 This HyPneu circuit shows a pump driven by an engine and connected to a hydraulic motor, which in turn, connects to a load. HyPneu’s If the displacement of the pump and motor are fixed, the HST simply acts as a gearbox to transmit power from the prime mover to the load. 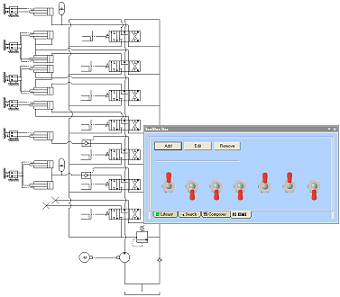 The HyPneu simulation uses both a variable-displacement pump and motor to regulate power, speed, and torque.